You can use powershell to turn off directory synchronization between AD-Onpremises and Office 365. Open Windows Azure Active Directory Module for Windows Powershell ( first, you need to install, you can download it, refer to this following link https://technet.microsoft.com/en-us/library/dn975125.aspx ). This article will describe how to create multiple dhcp scope on dhcp server using powershell with csv. after you created csv file, for example my csv file name is scope.csv. Actually this article very easy, but sometime someone need this to know list of domain controller on his organization. Type _ldap._tcp.dc._msdcs.Domainname, where Domainname is the name of your domain, and than press Enter. By default user in office 365 can not change password, change password can execute by administrator. This article will describe how to enable change password for user in office 365. 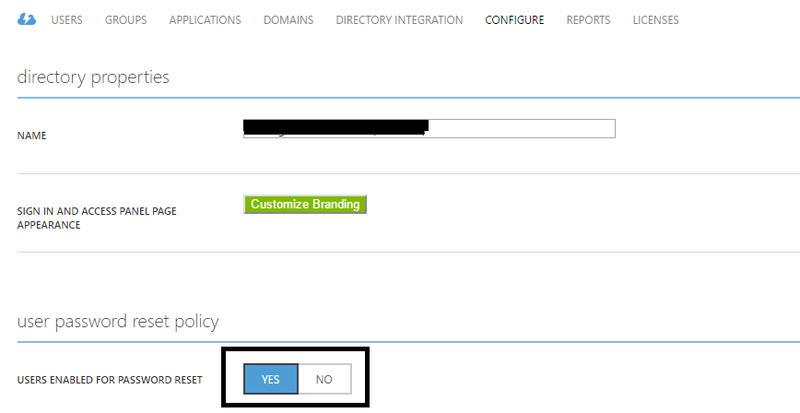 Go to Office 365 admin center, choose Azure Active Directory, klik your organization name klik configure. Then enable for password reset like this picture. This entry was posted in Uncategorized and tagged Active Directory, Azure, Office365. In office 365 admin not provided to add multiple group like add multiple user using csv. But if you required to do it you can use Windows Azure Active Directory Module for Windows PowerShell. First you need to download it. refer to this following link : https://technet.microsoft.com/en-us/library/dn975125.aspx . two weeks ago i implemented WSUS windows server 2012 R2 at my customer. after finish process installation, windows 10 on WSUS server show as windows vista. then i research and after read this article https://support.microsoft.com/en-us/kb/3095113 i can solve this problem. you need to install update from microsoft. after install update, you can solve the problem.